elBulli (Catalan pronunciation: [əl ˈβuʎi]) was a Michelin 3-star restaurant near the town of Roses, Catalonia, Spain, run by chef Ferran Adrià. 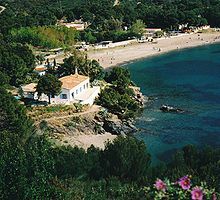 The small restaurant overlooked Cala Montjoi, a bay on Catalonia's Costa Brava, and was described in UK newspaper The Guardian as "the most imaginative generator of haute cuisine on the planet". The restaurant was also associated with molecular gastronomy. The restaurant closed on 30 July 2011 and was reopened as a creativity centre in 2014. The restaurant had a limited season: the PIXA season, for example, ran from 15 June to 20 December. Bookings for the next year were taken on a single day after the closing of the current season. It accommodated only 8,000 diners a season, but got more than two million requests. The average cost of a meal was €250 (US$325). The restaurant itself had operated at a loss since 2000, with operating profit coming from elBulli-related books and lectures by Adrià. As of April 2008, the restaurant employed 42 chefs. Restaurant magazine judged elBulli to be No. 1 on its Top 50 list of the world's best restaurants for a record five times—in 2002, 2006, 2007, 2008 and 2009, and No. 2 in 2010. The elBulli location was selected in 1961 by Dr. Hans Schilling, a German, and his Czech wife Marketa, who wanted a restaurant for a piece of land he had purchased. The name "elBulli" came from the French bulldogs the Schillings owned. The first restaurant was opened in 1964. The restaurant won its first Michelin star in 1976 while under French chef Jean-Louis Neichel. Ferran Adrià joined the staff in 1984, and was put in sole charge of the kitchen in 1987. In 1990 the restaurant gained its second Michelin star, and in 1997 its third. elBulli has published books on its development, menu and philosophy since 1993, in both large format, some including CD-ROMs, and small format for supermarket sales. Ferran Adrià, Juli Soler, and Albert Adrià published A Day at elBulli in 2008. The book describes 24 hours in the life of elBulli in pictures, commentary and recipes. Among the recipes included in the book are melon with ham, pine-nut marshmallows, steamed brioche with rose-scented mozzarella, rock mussels with seaweed and fresh herbs, and passion fruit trees. Anthony Bourdain described Albert Adrià's contributions thus: "His book is a shockingly beautiful catalog of his latest accomplishments here ... Pastry chefs everywhere—when they see this—will gape in fear, and awe, and wonder. I feel for them; like Eric Clapton seeing Jimi Hendrix for the first time, one imagines they will ask themselves 'What do I do now?'." Texturas is a range of products by Ferran Adrià and his brother Albert Adrià. The products include the Sferificación, Gelificación, Emulsificación, Espesantes and Surprises lines and are the result of a rigorous process of selection and experimentation. Texturas includes products such as Xanthan and Algin which are packaged and labeled as Xantana Texturas and Algin Texturas respectively. Xanthan gum allows the user to use a very small amount to thicken soups, sauces and creams without changing the flavour. Algin is a key component of the "Spherification Kit" and is essential for every spherical preparation: caviar, raviolis, balloons, gnocchi, pellets, and mini-spheres. In 2010, Ferran Adrià announced he would close elBulli in 2012, due to the massive monetary loss it was incurring. He was quoted by The New York Times as planning to replace it with a culinary academy. He later denied the announcement, saying that The New York Times had misquoted him, and stated that elBulli would reopen in 2014 after a two-year hiatus, as "initially planned" and would still serve food. Adrià later confirmed, in an October 2010 Vanity Fair article, that the restaurant would be closing permanently after July 2011, although the official elBulli website denied this. "The future of elBulli is established. Between January and February, Ferran Adrià announces that, once the season 2011 is over, elBulli will close during two years to reopen in 2014 under a totally new format, focused on the limits of creativity from an interdisciplinary view." As of 28 April 2011[update], the elBulli website listed that it would close in July 2011 "On July 30th 2011 elBulli will have completed its journey as a restaurant. We will transform into a creativity center, opening in 2014. Its main objective is to be a think-tank for creative cuisine and gastronomy and will be managed by a private foundation." Anthony Bourdain interpreted the goal of the new elBulli foundation to be an elite culinary and dining experience development workshop, hosting not only chefs but "architects, philosophers, [and] designers", and allowing them to "not just share [their] successes, but to share [their] mistakes or [their] process with the world as it's happening" by providing a forum to explore such concepts as "do we need a dining room?" As of 27 July 2012[update], the website states simply: elBulli restaurant has now closed and has been converted into elBullifoundation, but has links to a series of enigmatic videos about the vision for the foundation (which appears to be about cuisine just for the expertise, with "no reservations, no routines, no timetables"). El Bulli: Cooking in Progress is a documentary about the restaurant highlighting the iterative creative process that occurred behind the scenes. Directed by Gereon Wetzel, the film follows the creative team led by Ferran Adrià through the whole 2008–2009 season. It premiered at the 2010 International Documentary Film Festival in Amsterdam. In July 2013, Somerset House in London hosted an exhibition dedicated to the food of Ferran Adrià and elBulli. The exhibition looked back over the evolution of the restaurant's laboratory and kitchen. Multimedia displays examined the methods behind the creation of signature dishes and original sketches and hand written notes of the recipe creations were on display with plasticine models of the dishes that were served. ^ a b c Carlin, John (11 December 2006). If the world's greatest chef cooked for a living, he'd starve, John Carlin, The Guardian. Retrieved 2010-05-30. ^ "history". elbulli.com. Retrieved January 15, 2019. ^ "El Bulli, 'world's best restaurant', closes". BBC News. 30 July 2011. ^ Season 2010 Archived August 29, 2010, at the Wayback Machine (reservations). ElBulli.com, 2010. Retrieved 2010-09-16. ^ "Kochrevolutionär sucht neue Inspiration" (in German). Frankfurter Rundschau Online. 27 January 2010. Retrieved 2010-09-16. (EN translation). For 2010 price. ^ Gould, Kevin (3 February 2007). Who's for a Bulli burger?. The Guardian. Retrieved 2007-02-03. ^ a b "World's 50 best restaurants". Restaurant. 21 April 2008. Archived from the original on 16 April 2008. Retrieved 2008-04-21. ^ Matthew, Jukes (26 October 2002). "Bulli for us". UK: The Guardian. Archived from the original (review) on 30 September 2008. Retrieved 2010-09-16. ^ Fleming, Amy; Smithers, Rebecca (21 April 2009). "Gordon Ramsay off the menu as San Pellegrino's best restaurants are chosen". The Guardian (UK). Retrieved 2009-04-21. ^ a b c d "History of El Bulli". ElBulli.com. Retrieved 2010-02-13. ^ a b McInerney, Jay (Oct 2010). ""It Was Delicious While It Lasted", Vanity Fair Magazine". Retrieved 2010-09-16. ^ elBullibooks – Recopilación de información sobre los libros publicados por elBulli (catalog). El Bulli. Retrieved 2010-09-16. ^ "Spain". Anthony Bourdain: No Reservations. Season 4. Episode 17. 18 August 2008. ~20 minutes in. Travel Channel. ^ "Xantana Texturas – Texturas – Albert & Ferran Adria (El Bulli)". BienManger.com. Retrieved 2010-09-16. ^ "Algin Texturas – Texturas – Albert & Ferran Adria (El Bulli)". BienManger.com. Retrieved 2010-09-16. ^ Ferren, Andrew (12 February 2010). "El Bulli to close permanently". The New York Times. Retrieved 2010-02-12. ^ "Guide Girl" (15 February 2010). "Ferran Adrià denies reports that El Bulli will close permanently". Guide Girl blog. Caterer Search.com. Retrieved 2010-02-15. ^ Hanly, Catherine, ed. (22 February 2010). El Bulli will still serve meals when it reopens in 2014 Archived 2010-03-10 at the Wayback Machine. http://www.hot-dinners.com Hot Dinners]. Retrieved 2010-05-30. ^ "El Bulli". Anthony Bourdain: No Reservations. Season 7. Episode 12. 1 August 2011. Travel Channel. ^ "elBulli.com". Retrieved 2 August 2012. ^ "elBullifoundation". Retrieved 2 August 2012. ^ "El Bulli – Cooking in Progress". IDFA. Retrieved 2 August 2012. ^ "elBulli: Ferran Adrià and The Art of Food". Somerset House. Retrieved 16 July 2013. ^ "El Bulli the Exhibition..." Styl.sh. Retrieved 30 August 2013. El Bulli 1983–1993 (with Juli Soler and Albert Adrià), 2004. w/CD-ROM. History of El Bulli 1961–2006 (PDF). ElBulli.com, 2007. Spanish eatery tops table again. CNN. April 24, 2007.